“The Back 9” opens at the Skid Row History Museum and Archive on September 8. 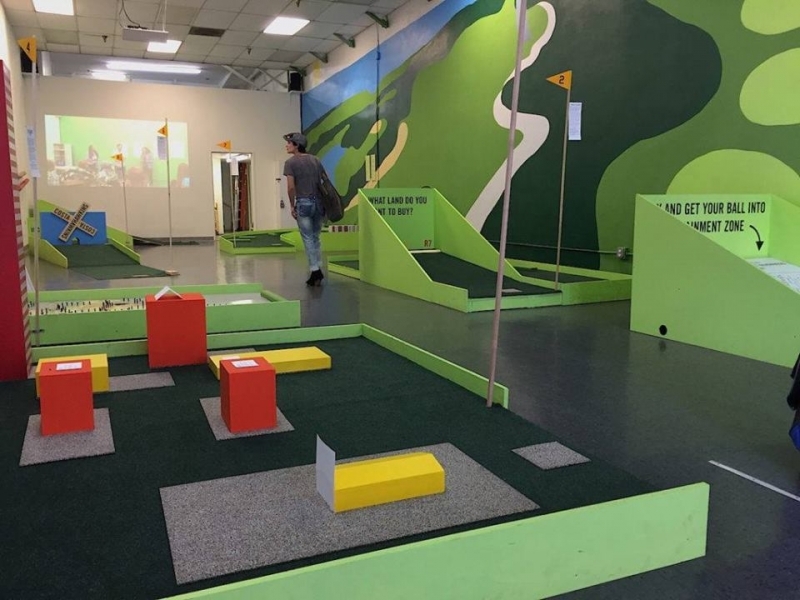 The exhibition, a collaboration between Materials & Applications, the Los Angeles Poverty Department, and Rosten Woo,is a playable educational golf course about zoning and redevelopment politics on Downtown LA. The Forum spoke to Los Angeles Poverty Department’s Artistic Director, John Malpede, about what it means to Play the Back 9. LA Poverty Department makes art with people living in the Skid Row community. We make performances, exhibitions, festivals, parades etc. We are concerned about the future of this recovery neighborhood. We initiated this project several years ago, when we became aware of Recode: LA and the new community plans that would accompany it, as we feared it would open up Skid Row to development and lead to the displacement of the extremely low income residents of the neighborhood, suppress any who avoided displacement, and totally disregard the homeless people who gravitate Skid Row because that is where the services are. Why design the exhibition as a miniature golf course? “The Back 9” connotes a place where decisions are made in private, among the powerful that pre-determine what the public, participatory conversation will be. In this case, the in the works zoning and community plans are designed to overwhelm Skid Row with market rate development and ultimately to push out the current residents and create an environment where any current residents who are able to remain in their housing will find themselves living in inhospitable surroundings. Even if they avoid displacement their neighborhood will have been hi-jacked. We asked Rosten Woo to design the golf-course because of his unique ability to make policy things and government processes, intelligible, fun and visually exciting. From the inception of the project, the golf course was planned as an installation playable by the public and as the set for “ The Back 9” performance that LAPD presented in June that addressed the same issues. Why focus on zoning and redevelopment politics? LA Poverty Department’s mission: Los Angeles Poverty Department (LAPD) creates performances and multidisciplinary artworks that connect the experience of people living in poverty to the social forces that shape their lives and communities. LAPD created the Skid Row History Museum & Archive space in 2015, specifically to address issues of community and displacement in downtown LA. Recognizing that Broadway has always been a vital street for the Skid Row community, we were eager to do our civic duty of “bringing it back”,—though completely puzzled by the thought that it was somehow missing.